An artist's concept of the heliosphere, a magnetic bubble that partially protects the solar system from cosmic rays. Galactic cosmic rays have just hit a Space Age high, newdata from a NASA spacecraft indicates. "In 2009, cosmic ray intensities have increased 19percent beyond anything we've seen in the past 50 years," said RichardMewaldt of Caltech. "The increase is significant, and it could mean weneed to re-think how much radiation shielding astronauts take with them ondeep-space missions." The surge, which poses no threat to Earth, was detected by NASA'sACE (Advanced Composition Explorer) spacecraft. The cause of the surge is solarminimum, a deep lull in the sun's activity that began around 2007 andcontinues today. Researchers have long known that cosmic rays go up when solaractivity goes down, because strong solar activity inflates and bolsters aprotective bubble around our entire solar system. Right now solar activity ? marked by sunspots, solar flaresand space storms ? is as weak as it has been in modern times, setting the stagefor what Mewaldt calls "a perfect storm of cosmic rays." Galactic cosmicrays come from outside the solar system. They are subatomic particles ? mainlyprotons but also some heavy nuclei ? accelerated to almost light speed bydistant supernova explosions. Cosmic rays cause "air showers" of secondaryparticles when they hit Earth's atmosphere, where they can pose a threat toorbiting satellites ? a single cosmic ray can disable a satellite if it hits anunlucky integrated circuit. Though some have suggested that cosmic rays might be behindthe Earth's current warming climate, research has shownno firm link between these invading rays and global warming. Cosmic rays also pose a health hazard to astronauts. Severalreports have outlinedthe risks from cosmic radiation that might exist for future missions toMars or stints on the moon. The sun's magnetic field ? 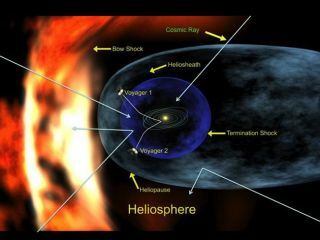 the heliosphere, which surroundsthe entire solar system ?is our first line of defense against these highly-charged,energetic particles. But the current state of solar activity means the solarsystem isn't as protected right now. "We're experiencing the deepest solar minimum in nearlya century," says Dean Pesnell of the Goddard Space Flight Center, "soit is no surprise that cosmic rays are at record levels for the SpaceAge." The sun's magnetic field is weak. The solar wind is flagging. The heliosphere's so-called "current sheet" isflattening. "Measurements by the Ulysses spacecraft show that solarwind pressure is at a 50-year low," Mewaldt said, "so the magneticbubble that protects the solar system is not being inflated as much asusual." A smaller bubble gives cosmic rays a shorter-shot into thesolar system. Once a cosmic ray enters the solar system, it must "swimupstream" against the solar wind. Solar wind speeds have dropped to verylow levels in 2008 and 2009, making it easier than usual for a cosmic ray toproceed. The flattening of the magnetic field's current sheet is alsomaking it easier for cosmic rays to penetrate the solar system's defenses. To picture thecurrent sheet, imagine the sun wearing a ballerina's skirt as wide as theentire solar system with an electrical current flowing along the wavy folds.That is the "heliospheric current sheet," a vast transition zone wherethe polarity, or direction, of the sun's magnetic field changes from plus(north) to minus (south). The current sheet is important because cosmic raystend to be guided by its folds. Lately, the current sheet has been flatteningitself out, allowing cosmic rays more direct access to the inner solar system. "If the flattening continues as it has in previoussolar minima, we could see cosmic ray fluxes jump all the way to 30 percentabove previous Space Age highs," Mewaldt said. Before the satellite era, it was not possible to measurecosmic rays directly, since they don't penetrate to the ground. Earth is in no great peril from the extra cosmic rays. Theplanet's atmosphere and magnetic field combine to form a formidable shieldagainst space radiation, protecting life on the surface. In fact, humans have weathered storms much worse than this.Hundreds of years ago, cosmic ray fluxes were at least 200 percent higher thanthey are now. Researchers know this because when cosmic rays hit theatmosphere, they produce an isotope of beryllium, 10Be, which is preserved inpolar ice. By examining ice cores, it is possible to estimate cosmic ray fluxesmore than a thousand years into the past. Even with the recent surge, cosmicrays today are much weaker than they have been at times in the past millennium. "The space era has so far experienced a time ofrelatively low cosmic ray activity," Mewaldt said. "We may now bereturning to levels typical of past centuries." NASA spacecraft will continue to monitor the situation assolar minimum unfolds, the agency said. Death RaysFrom Space: How Bad Are They?